Democratic congressional candidate Alexandria Ocasio-Cortez banned the media from attending a series of campaign town halls last week. "Just wrapped up an amazing community conversation & listening tour stop in Corona, Queens!" the New York Democrat announced on Twitter Sunday. "Guess what: we talked about race, immigration, healthcare, disability rights & housing… and everybody was fine!" "Ocasio2018 Bronx & Queens stops are designed to foster community and restore civic life," she continued. "They are intended for lively, compassionate discourse with a diversity of viewpoints." But what exactly was said at the town hall will remain a mystery to those outside the room. The Ocasio-Cortez campaign banned the media from attending both events, even though they were open to the public, The Queens Chronicle reported Thursday. 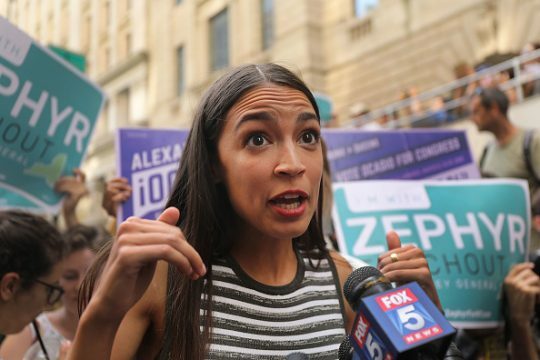 Ocasio-Cortez spokesman Corbin Trent told the Chronicle that the event was closed to the press to avoid "unwanted attention," complaining she was "mobbed" by reporters at a Bronx community meeting earlier that week. "We wanted to help create a space where community members felt comfortable and open to express themselves without the distraction of cameras and press. These were the first set of events where the press has been excluded," Trent said. He promised that the media ban was "an outlier" and not the new norm. The press blackout came after several of Ocasio-Cortez's public comments were scrutinized by the media and fact-checkers alike. A Washington Post Fact Checker roundup last Friday for example singled out six false or misleading claims made by the candidate, including claims that fellow fact-checker PolitiFact had rated "Pants on Fire." This entry was posted in Politics and tagged Alexandria Ocasio-Cortez. Bookmark the permalink.